Marathon Oil reported last week it is reducing 2015 capital spending another 20 percent from their initial December forecast. These cuts bring the projected capex to $3.5 billion, which is less than half of 2013 spending and includes exploration spending of $232 million. Marathon Oil will continue to focus on activity in the Eagle Ford and plans to spend 41% of its 2015 in the Texas region. 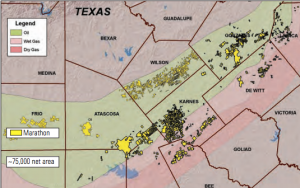 Of the $1.4 billion earmarked for the Eagle Ford, approximately $1.0 billion is dedicated to drilling and completions. The company will drill 141-152 net wells and bring 176-192 total wells to sale in the new year. Marathon Oil has increased its acquisitions in the Eagle Ford over the last several years and now holds approximately 211,000 net acres in the Eagle Ford. has invested strategically to grow its presence in the formation’s highest value oil and condensate core areas. Activity is focused on Atascosa, DeWitt, Gonzales and Karnes counties.